This is one of Joann's Block of the Month Quilts, called Nature's Bounty. There are two more appliqued blocks to be added, plus borders. 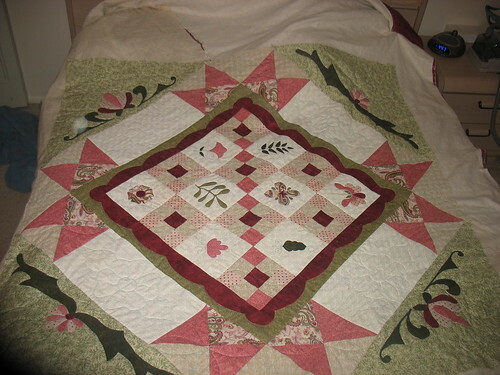 I have used a quilt-as-you-go method based on Harriet Hargrave's Heirloom Machine Quilting. Everything in the picture has already been quilted. The two appliqued blocks to be added have already been quilted too. Once those blocks and the borders are added I will just have to quilt the borders and then bind the quilt. I live in Maryland with my husband and son. My grandmother taught me how to crochet when I was a child, and I have added several new hobbies since then. Twilight Novel Novice: Challenge Winner!